"Like a Fitbit for your face!" 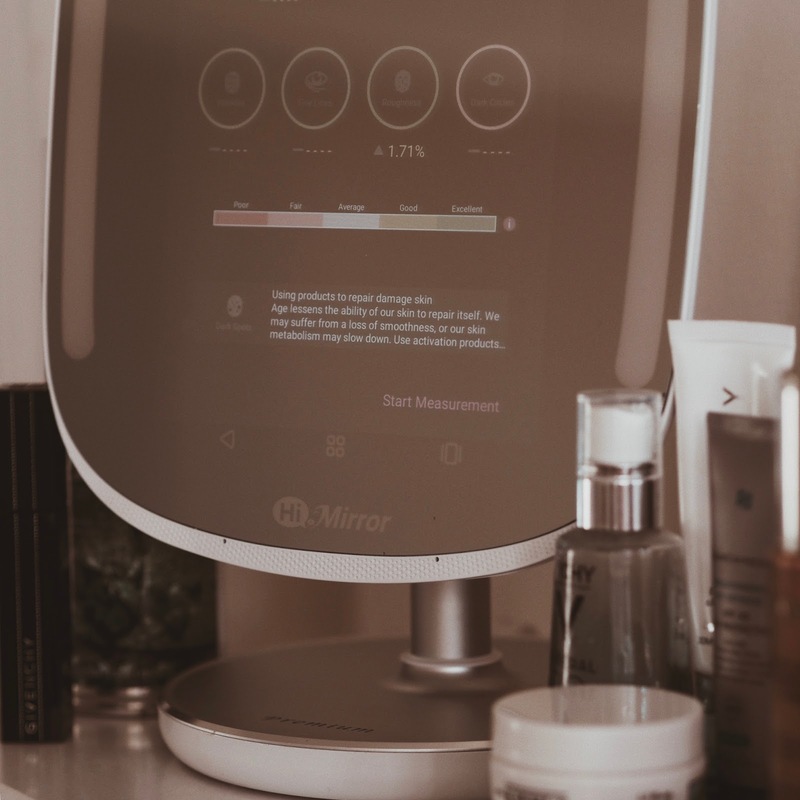 Imagine a mirror that will create the perfect lighting for you to apply your makeup, provide you with a daily detailed analysis of your skin and will let you track the effectiveness of the skincare products you are using on your face. Oh and all top of all that will let you play music, watch YouTube videos and access your social media channels at the same time? You can stop imagining, because HiMirror Mini is the latest gadget to hit the beauty world that will let you do all of the above! So is it too good to be true? I've been testing the HiMirror Mini for a couple of months now in order to test out all the features properly before putting pen to paper, so to speak, and giving my honest thoughts on whether this mirror is worth the hype or not. "...help those who care about their appearance and skin health..."
HiMirror Mini is the brainchild of Simon Chen who created a product inspired by his wife, a Virgo striving for perfection (I can relate!!!). He wanted to revolutionise the health and beauty industry by creating a product that would help those who care about their appearance and skin health. The result is a hi-tech mirror that looks fairly inconspicuous on your dressing room table but certainly packs a punch in terms of its functionality. The HiMirror Mini works by being connected to the internet and has a built in camera. Essentially, it's a smart mirror that works very much like a tablet. It has some very nifty light settings and the ability to analyse your skin and monitor the effectiveness of skincare products. Ok, enough background info, let's cut to the chase with the nitty-gritty info shall we? I have to admit, I've become a little bit addicted to taking my makeup off at night then letting my HiMirror take my photo of my makeup free face to analysis my skin whilst I sit there for a couple of seconds with baited breath waiting to see if my pores have got better or worse than yesterday! (I'm well aware I need to get out more!!) It takes only a few seconds but over a period of a time you are able to see if your complexion is improving, and if the skincare products you are investing in are actually working or are you better off using that £3 moisturiser from Boots instead? The HiMirror will assess your skin's condition and monitor problems such as dark circles, red spots, fine lines, wrinkles, pores, dark spots and roughness. This is a feature of the HiMirror that I really find useful and seems to be working effectively for me. I also feel as though it has helped me to be more conscious of what my skin needs, too. Another great feature of this revolutionary mirror that I love. When you start using a product, simply scan it into the HiMirror and it will track if the product is improving your skin as you use it. Genius! Over time it will also give you personalised product recommendations based on your skin and the weather of the area you live in. Hands up who struggles to get good light on those dark mornings or trying to get ready for a night out when natural light is diminishing? This is where the HiMirror comes into its own, with not one light setting but five preset scenarios that will mimic lighting outdoors, in a brightly lit office, a shopping mall (I feel HiMirror has it's target market spot on here! ), a restaurant or party or a sunset view. Brightness is fully adjustable and I've been finding this function so so useful, especially in the last few weeks. Admittedly, not a function I have used a great deal (the sight of my face magnified tends to scare me!) however, I did find it incredibly useful when applying liquid eyeliner and I would imagine it would be good for applying any sort of product that requires precision. What I like to call 'the extras'. You can actually link up your Amazon Alexa to this mirror so that you can activate the functions by using just your voice (and therefore eliminating any fingerprint smudges that appear on the mirror due to it also acting as a touch screen!) this is a function I've yet to use yet, mainly due to the fact I don't really care for the Alexa I have in my house anyway! What I do love though, is the ability to play my Spotify app via the mirror, as a person who has a real passion for music this is a useful feature, and I especially like it for when I'm getting ready for a night out and I pop on my 'favourites' playlist! You can also access your Instagram, Facebook and YouTube accounts via the HiMirror however I don't really see the point in this and haven't used these features. I did try YouTube to watch a makeup tutorial and thought that I'd be able to have it in the corner of the mirror however, disappointingly it covers the whole surface so you can't look in the mirror at the same time. I'll be honest, at first when I was offered to trial the HiMirror I thought it was going to be a bit gimmicky and I had my doubts about it. Even after using it for a week I was a little underwhelmed, however now I've had chance to use it everyday for a sustained period of time I couldn't be without it! 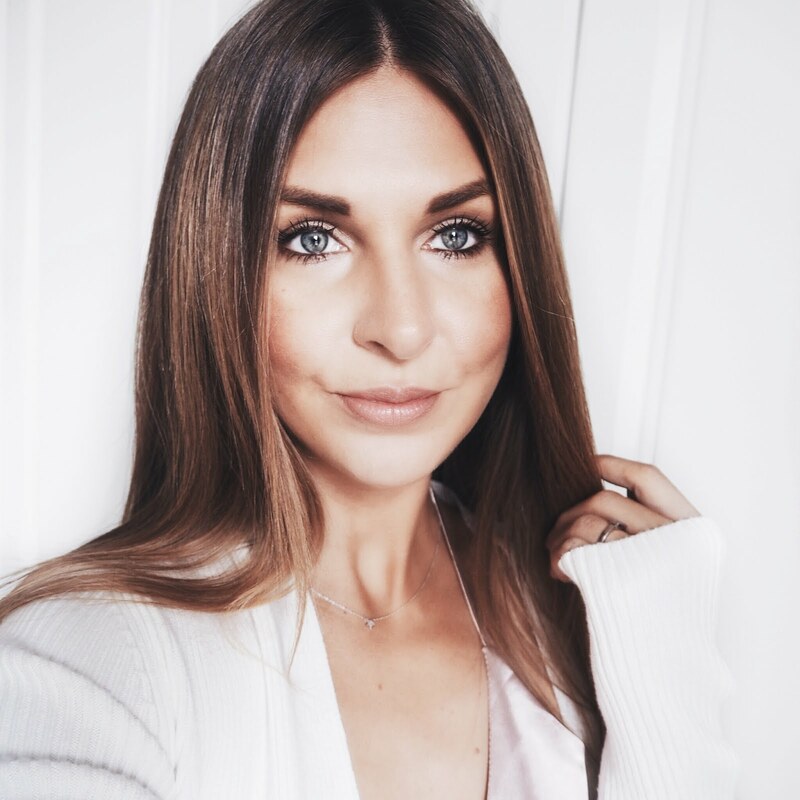 I've been really impressed with the skin analysis feature and it has really made me think about targeting my skin problems rather than just slapping on what I think my skin needs. If I had to identify some downsides of the HiMirror they would be that because the mirror is essentially also the touchscreen, it gets dirty very quickly and covered in fingerprints and for a clean freak like myself this can be a little annoying! I'm also a little disappointed you can't play YouTube videos on the screen whilst still being able to look in the mirror, however these really are only minor flaws in relation to what the mirror can actually do! HiMirror Mini is available to buy from Amazon HERE. I was gifted the mirror in return for a review (with the option to return it if I didn't like it) my thoughts are all my own and I genuinely feel this is a great product for anyone that is into looking after their skin and applying makeup.